1. The contest is open to all residents of North Ogden, UT. 2. All entries must be original creations of the contestant and incorporate the theme of the 4th of July into the design. The creation must never have been published, and does not contain profanity, trademarks, logos, or copyrighted works of any other person or business. 3. 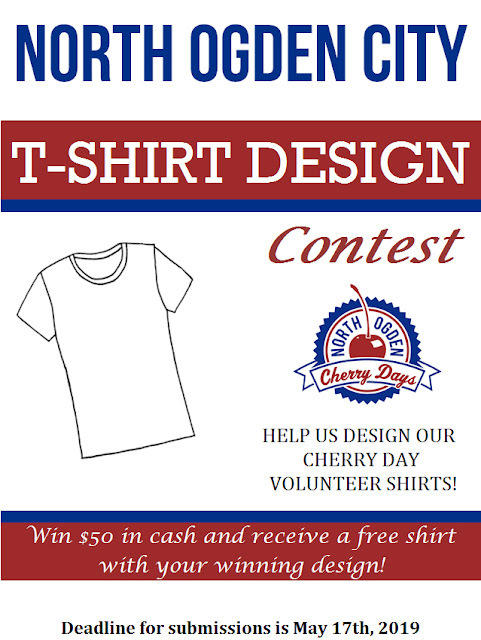 If a winning design is selected, the prize is $50 cash and a shirt. 4. The winning design will remain the property of the North Ogden City and will not be returned to you. North Ogden City may use the winning design at any time after the contest. The winning designer may display their own design in a portfolio or personal collection, but may not sell or reproduce the design for any other purpose once submitted to the contest. 5. The top five (5) entries will be picked via the North Ogden City Facebook Page. 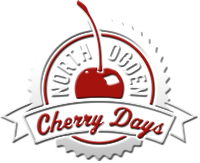 The winner will be selected by the North Ogden Cherry Days Committee. The winner will be notified by May 31st, 2019. 6. The contest begins on March 12, 2019. 7. The entries must be received online by May 17th, 2019 at 11:59pm. Entries can be submitted via email to ssmith@nogden.org. 1. The entry should be accompanied by your name and contact information. But not included IN the actual design. 2. Acknowledgement that the contestant has read and agrees to the rules must be included with the entry. Either a signed copy of this form or a written statement within the email should be included. 3. The entry must be done in a digital format, large enough to fit on a tee shirt. The entry may be any of the following art file formats: .AI, or .PDF. (roughly 8”x11” or similar dimensions). Hand drawn entries are acceptable if they can be submitted electronically. 4. The colors red and blue should be incorporated in the design with the design intended for use on a white t-shirt. 9. We reserve the right to pick one entry, more than one entry, or no entries as the winning entry. 10. North Ogden City reserves the right to terminate this contest at any time, effective on the date of issuing the termination notice, and we are under no obligation to give notice prior to the date of termination. 12. This contest is subject to all federal, state and local laws. I am submitting a contest entry with this form, and I hereby assign any and all rights in the intellectual property of this entry to North Ogden City. I agree that the entry I submit becomes your property and that the entry will not be returned to me. I state that this entry is my own original creation and that I did not copy anyone else’s work in creating this contest entry. I agree that if I have copied anyone else’s work in preparing this entry, and if I win this contest, I will pay back the award to you and will defend, indemnify and hold harmless North Ogden City, their respective officers, directors, and agents against and from any loss, debt, liability, damage, obligation, claim, demand, judgment or settlement of any nature or kind, known or unknown, liquidated or unliquidated, including without limitation, all reasonable costs and expenses incurred including all reasonable litigation costs and attorneys’ fees arising out of or relating to claims, complaint, action, proceeding or suit of a third party, that arise or relate in whole or part to the contestant’s entry. I agree that if I win the contest, I authorize the use by you, without additional compensation, of my name and likeness or photograph for promotional purposes in any manner and in any medium (including without limitation the Internet, written or email communications, brochures, videos, slides, radio, television, film) that you deem appropriate. I agree that if I win this contest, the prizes outlined in the rules are fair and adequate compensation for my contest entry.